Ventus 520 is a compressed-air-operated labelling unit. Ventus 520 is particularly suited to the product lines, where the labeling must happen quickly. 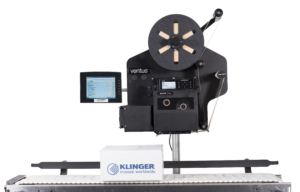 Ventus 520 fastest labelling speed is 70 labels per minute (label dimensions 25 x 30 mm). Ventus 520 is most efficient when printed labels are same size. The label can contain large amount of dynamic information: eg bar codes, product numbers, dates of manufacture etc.